Zoovie Night ~ A Great Big Shout Out to the Parents and Grandparents who get painted for family fun! Another Sumner County Fair has come to a close. What fun! Thank you to all who came to stop by and be face painted. It was great seeing familiar faces and meeting new friends! If you tried the new "water resistant" make up, let me know how it lasted and how easy it was (or not) to remove. I often get asked how are the pictures used that are taken of my child? It may be a new design that your child and I developed on the spot. I will take a pic to remember it. It may be used for a menu board or advertisement of some kind, including social media. If it is really a terrific shot, it may go into my portfolio. Please keep in mind that photographs may be taken by anyone attending the event. It is a photo share zone! Our artists will occasionally take pictures which may be used (but not limited to) any of the ways listed above. Most of you love having your picture taken. They are a way to share your experience and enjoy your face. IF YOU OBJECT TO YOUR CHILD'S PHOTO BEING TAKEN BY THE ARTIST PLEASE TELL US. We never share a child's name or personal information. In fact we may never even know it. Every year I attend Courses, Workshops and Conventions to keep my skills sharp, learn new things and how to be of better service to my clients. What a perfect day for an Easter egg hunt at the Nashville Zoo! The weather was delightful and smiles were around Thank you all who visited the face painters. It was a pleasure to meet you! 2017 welcomes a great addition to Tennessee . . . Pro Aiir, makers of Hybrid and airbrush make-up moves to Sevierville! A big WELCOME to Donna and her team! A big shout out to the Nashville Zoo!! What a great getaway or day trip. Meeting so many new friendly faces. July 1st, 2017...H20 was a super way to keep cool and Zoovie nights are awesome. Looking forward to seeing friends at the next one August 18!! Check out their schedule for more events! Come see us and enjoy a wonderful evening celebrating and encouraging peace, Sept. 21, East Nashville Park at the Peace Day Concert. Put on a face for Peace! We are so pleased to announce the following award from Thumbtack! Thank you to our clients for your confidence in us! Fellow Face Painters: We are pleased to host Léa Selley, August 14, 2015 on her USA Tour. 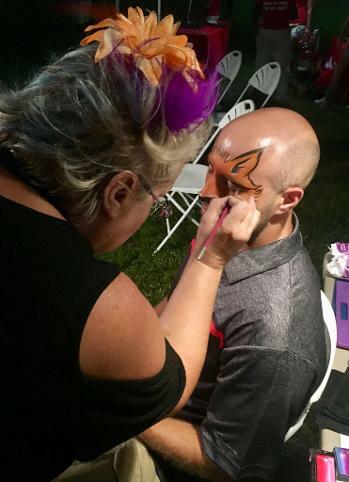 June and July: All for a Face artist, Corinne painted guests at the Universoul Circus in Baltimore and will be at the National Harbor location later this month to July 19. New dates and cities added: St. Louis, Memphis, and weekends in Detroit and Chicago! Airbrush Tattoos look real and last from 2 to 7 days. Models needed. Call to get yours. 615 866 7508. Must be 18 or have parents permission. May 2-11 2015 What a jam packed week! Painted at the Westfield Street fair with my good friend, Diane. Did a Body Paint on Tuesday. Wednesday through Friday Airbrushed with Donna Nowak, owner of PRO AIIR makeup; and worked facepainting at the circus again in Queens, NY. Met great people and had an awesome time. Sunday, April 12, 2015 I was pleased to be a featured artist at the Universoul Circus while I visited Brooklyn, NY. It was great seeing my circus friends, and all the wonderful folks who let me paint them. Thank you so much. If you are anywhere near a city this circus visits, you would do well to check out this tremendous family fun show! Not to be missed. Thought we'd share this blog post from last year. Thanks paintentertainment. (2015, Apr.) April is showering us with Canadians. Meeting with our friends on the east coast. We'll be taking courses with Sean Avram, Wiser Oner, and Lea Selley! (2015, Mar.) Our goal this month is to have our studio space operational by the end of April! Look for updates to our progress at on our facebook page. (2014 Oct) Beware of Zombies (and other creatures) All For A Face provided makeovers for NJ ZOMBIEWALK, and Nashville Zombie walk. (2014, Sep.) Corinne recently received the distinguished honor of becoming the only CERTIFIED Face painter in Tennessee. She holds a certification from FACE, the international organization that tests adherence to high quality standards for the industry. Please make sure that you are hiring only a CERTIFIED face painter if you want to insure the best in safety and quality. Thank you, CDF Distributors, LLC., for including All For A Face at your company picnic. An awesome time was had by all, the children were adorable, and the faces were colorful! Corinne's newest goal is to start a guild in her new home, middle TN. Please contact All For A Face if you would like more information on Guild Membership. (2011) Corinne Rodgers was elected the Audio Visual Adviser and webmaster of the No. New Jersey Face and Body Art Guild. This group is dedicated to the continuing education of face and body artists, by bringing masterful instructors to the New Jersey area, sharing tips and tricks, and practice, practice, practice. "I'll never forget Emily's face when she saw her face in the mirror. Priceless! Thank you!" Help us build a following here in Nashville! Like us on Facebook. We want to keep in touch with you! If you want to receive a monthly newsletter geared to party planning tips and event ideas, click the "subscribe" button. to learn how we can make your event more magical!